Early morning in Etosha is alive with activity. Wildebeest, Ostrich, Elephants, Antelope, and Zebra all begin the day migrating to watering holes to refresh after surviving another night on the plains with predators such as Lions, Cheetahs, and Leopards. Situated above one such watering hole, I was fascinated by a dust cloud arising from a herd of Zebra. Bringing out my long lens, I quickly focused in on the activity to find a pair of young Zebra playing amidst their mates in the early morning sun. Nipping and biting at each other, I was enchanted. 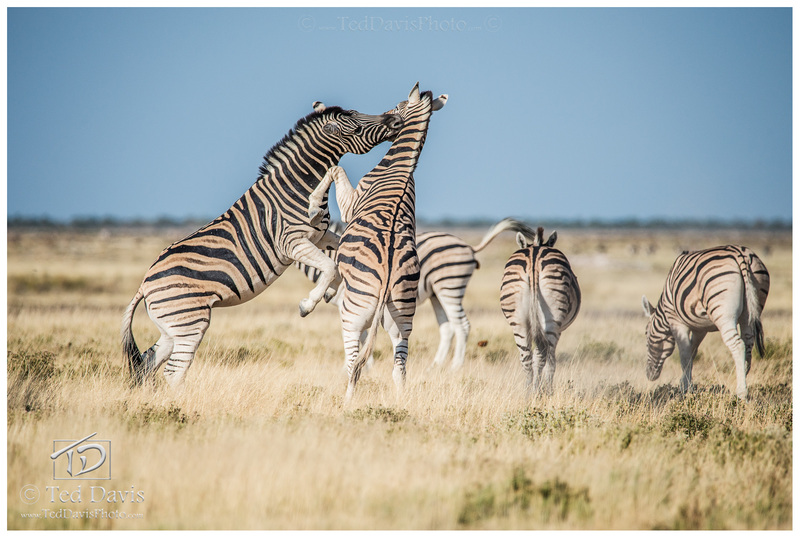 As they rose up on hind legs, I quickly snapped my shot – a scuffle on the steppes of Etosha National Park, Namibia. Photo © copyright by Ted Davis.